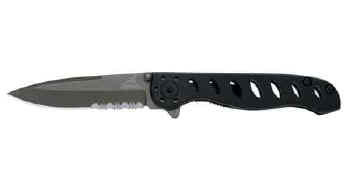 EcoVantage Catalog: Gerber EVO™ Jr. Introducing a clip folder for knife people who prefer the look of a straight spine; the profile reveals a "seamless" design that begins at the back of the blade and continues along the length of the upper edge of the handle. In fact, the EVO and EVO JR. actually have a little bit of the dagger in them. Another aesthetic design touch is the series of seven slanting oval openings in the anodized aluminum handle. They serve to make these knives both organic and aggressive. Functionally, the oval openings further reduce the overall weight of these knives to near nothingness. The blades are constructed of high carbon stainless steel that is coated with titanium nitride for added corrosion resistance. There's a thumb stud and finger clip for easy one-handed opening. And, there's an integral finger guard for an extra measure of safety. Bottom line? Youd do well to own such a highly evolved knife.